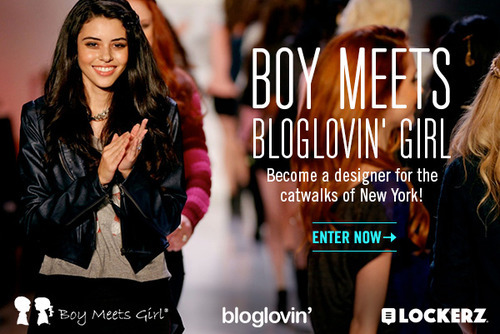 So excited to announce this contest.. me and my brand Boy Meets Girl® teamed up with Bloglovin’ and Lockerz to offer you the chance to win this Outrageous Fashion Week experience! 1. A trip to NYC in February to attend the Boy Meets Girl® by Stacy Igel New York Fashion Week Show and the 2013 Bloglovin’ Awards! 3. Assist me in designing a runway look for New York Fashion Week! 4. See the design come down this runway! 5. The limited edition item will be produced and sold exclusively in the Boy Meets Girl® shop on Lockerz beginning in March 2013! 6. And to top it off get to have a one on one with me and some of the Boy Meets Girl® & Bloglovin' team members at a NYC hot spot for dinner. Head to bloglovin’ here for all of the Contest details and find out what you have to do to enter! And see this contest entry I put together as an example of what you guys need to do! Hope to see you in February! Feel free to tweet us and ask questions using our contest hashtag #TAKEME2NYFW.. Good luck everyone!